The march of Wi-Fi goes on, Call it Bluetooth, Miracast, Ultra Wideband (UWB), Home RF etc. It doesn't matter all have the potential to set us free. All are variations on the same theme, some offering faster speeds than others, some offering better range and some offering power savings. 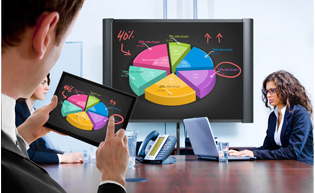 Miracast has taken the lead for iOS, Windows and Android smart phones. The main thing to remember here is that the current technology is designed for Data presentations. Yes there are Projectors that offer HD Wi-Fi for home and they work very well, but the tech wont fit in your phone just yet. Refresh rates when streaming video through Wi-Fi can be unreliable and can be affected by other Wireless usage in the same building or by neighbors - Things that you wont be able to control when you project. It may work well one day and not the next. Obviously the lower the resolution of the video the more successful you will be, but for now, hold on to the cable just incase. Wireless LAN technology, originally developed for easy and secure communications by the military, declassified in the mid-70’s by the University of Hawaii to connect its island-bound campuses in the late '60's , has been adapted for use in business enterprise environments, small businesses and more recently in the home environment. It and the modulation scheme, Spread Spectrum (declassified in the mid 70's), originally developed to create a secure communication medium in the field of battle, has evolved to provide an ease of use alternative to traditional hard-wired network installations. The wireless LAN ease of use concept extends to address the users’ perception that connecting to network devices is difficult and has required expert network knowledge. Since the initial military implementation was costly, and was not governed by sufficient standards bodies, commercial adoption was slow to take hold. Following the publication of several important IEEE standards, initially the IEEE 802.3 Ethernet standard, and specifically the 802.11 standard, the wide spread adoption of wireless technology has taken place. The IEEE 802.11b (11 megabits per second) standard is the most widely used technology today for wireless LANs. As the need for bandwidth grew, 802.11a was specified in 1999 as a Physical Layer (PHY) standard to operate at 5GHz frequency band with possible data rates between 6-54 Mbps. Those products are slowly becoming available to a wider public. The additional advantage of 802.11a over 802.11b is that there is also much less interference with radio at its 5GHz frequency in comparison to 802.11b and 802.11g. 802.11a does increase its transmission power to 50mW, but even so, 802.11a does not handle either longer transmit distances or obtruding objects (walls, furniture, etc.) as well as 802.11b. 802.11b is a half duplex protocol – it can send OR receive, but not both at the same time. In addition it uses the same 2.4 GHz range as many cordless phones so plenty of opportunity exists for interference. Use 900Mhz cordless phones if using 802.11b in the same area. Communicating devices using 802.11b wireless technology actually require the simultaneous use of two distinct technologies; RF radio transmission and traditional Internet Protocol (IP) network protocols. In order to have a complete overview of wireless fundamentals, it is necessary to understand the concepts that originate from both disciplines. 802.11b wireless hardware is typically used in either a simple Ad-hoc configuration or in an increasingly the more common Infrastructure configuration. The InFocus LiteShow product utilizes the simple Ad-hoc configuration, allowing a mobile device such as a laptop to connect directly to a LiteShow-enabled projector to provide for cable-free presentations. To help define the standard of development of access points (APs) for wireless technologies to bridge the information flow, 802.11c was established and its work has already been concluded. As the operation, especially in the 5GHz range, may differ from country to country (or domain to domain), the 802.11d protocol was established. It also better defined interoperability issues. With the expansion of wireless device technologies and the feature-rich applications already in development for video and audio (voice), it was apparent that the 802.11 PHYs were not quite optimized to full fill such tasks. This lead to the development of 802.11e which refines a 802.11 medium access layer (MAC) to prioritize traffic to improve quality of service (QoS) for support of video and audio. This standard is still in progress. The non-existence of 802.11e should not impact wireless decisions as it will affect all of the PHY layers for 802.11. The original 802.11 media access control protocol was designed with two modes of communication for wireless stations. The first, Distributed Coordination Function (DCF), is based on Carrier Sense Multiple Access with Collision Avoidance (CSMA/CA), sometimes referred to as "listen before talk." A station waits for a quiet period on the network and begins to transmit data and detect collisions. DCF provides coordination, but it doesn't support any type of priority access of the wireless medium. An optional second mode, Point Coordination Function (PCF), supports time-sensitive traffic flows. Wireless access points periodically send beacon frames to communicate network identification and management parameters specific to the wireless network. Between the sending of beacon frames, PCF splits the time into a contention-free period and a contention period. With PCF enabled, a station can transmit data during contention-free polling periods. However, PCF hasn't been implemented widely because the technology's transmission times are unpredictable. Because DCF and PCF do not differentiate between traffic types or sources, the IEEE is proposing enhancements in 802.11e to both coordination modes to facilitate QoS. These changes would let critical service requirements be fulfilled while maintaining backward-compatibility with current 802.11 standards. The proposed enhancement to DCF - Enhanced Distribution Coordination Function (EDCF) - introduces the concept of traffic categories. Each station has eight traffic categories, or priority levels. Using EDCF, stations try to send data after detecting the medium is idle and after waiting a period of time defined by the corresponding traffic category called the Arbitration Interframe Space (AIFS). A higher-priority traffic category will have a shorter AIFS than a lower-priority traffic category. Thus stations with lower-priority traffic must wait longer than those with high-priority traffic before trying to access the medium. To avoid collisions within a traffic category, the station counts down an additional random number of time slots, known as a contention window, before attempting to transmit data. If another station transmits before the countdown has ended, the station waits for the next idle period, after which it continues the countdown where it left off. No guarantees of service are provided, but EDCF establishes a probabilistic priority mechanism to allocate bandwidth based on traffic categories. Another way 802.11e aims to extend the polling mechanism of PCF is with the Hybrid Coordination Function (HCF). A hybrid controller polls stations during a contention-free period. The polling grants a station a specific start time and a maximum transmit duration. EDCF appears to be gaining more early acceptance than HCF. The 802.11e standard isn't likely to be ratified until next spring or later. In the meantime, a group of vendors have proposed Wireless Multimedia Enhancements (WME), much like Wi-Fi Protected Access , to provide an interim QoS solution for 802.11 networks. Without a standard, the risk of non-interoperable mechanisms proliferating in the marketplace would inhibit the overall goals of the 802.11e standard. The intention of WME is to provide a well-defined and accepted 802.11 QoS mechanism that will prevent the spread of non-interoperable methods while waiting for the ratification of the 802.11e standard. This protocol specification addresses the roaming need for transmission for a user from one access point (AP) to another and ensures the continuity of transmission; it would ultimately provide inter-access point protocol. Until this becomes commonplace, the safest bet will be to standardize on the same vendor for all of your access points. The "g" technology specification is still in the works and is the most recent redefinition for 802.11. Its goal is defined as extension to 20+ Mbps rate by adding one more channel to the current three in the operation spectrum of 2.4GHz, which would compete with 802.11a rates with 802.11b's better transmit distances, and handling of reflections and occlusions. And because it works in the same 2.4GHz frequency, it ought to allow easier interoperability between 802.11b and 802.11g. 802.11g also offers backward compatibility with 802.11b, so that you won't have to toss all the 802.11b gear you've accumulated. But compatibility remains the large question mark over 802.11b products, and it's quite likely that not all 802.11b products will talk to 802.11g access points. 802.11g has been found to deliver better than 2X the throughput of 802.11b, although it's well shy of matching 802.11a's performance at close range. But like both a and b, 802.11g still lacks Quality of Service (QoS) provisions. We won't see these until the arrival of the 802.11e spec later this year. Even with the improved throughput, 802.11g still provides what's called best effort service to all traffic on the wire, whether it's streaming video or copying a large file. An extension of 802.11a to satisfy regulations in Europe for the spectrum band of 5GHz by providing dynamic channel selection (DCS) and transmit power control (TPC). If it does, it may possibly supersede 802.11a. The successor to 802.11a/g aimed at consumer applications that require very high throughput, like HDTV and streaming video. It is expected to run up to 50 times faster than the current wireless standard, 802.11b, and offer an expanded operating distance. 802.11n isn't expected to become a standard until late 2007. The use of 802.11g and 802.11a technology is rapidly growing, These two initiatives offer increased data rates (54 megabits per second) and additional bandwidth utilization this should allow wireless transmission of HDTV to your projector. 802.11g is a kind of hybrid of 11a and 11b. It uses the same transmission technology found in 802.11a, which is called Orthogonal Frequency Division Multiplexing (OFDM). This increases the amount of data transmitted in a given time slice. However, unlike 802.11a, which operates in a 5GHz band, 802.11g uses carrier frequency bands that are around 11b's 2.4GHz primary carrier frequency. Ad-hoc Network Topology In this typical Ad-hoc wireless network topology; notice that there is no requirement to have the stations connected into the Local Area Network (LAN). In Ad-hoc mode, the stations form their own local network where the end nodes communicate peer-to-peer without the requirement of an Access Point. Two or more stations establish a Basic Service Set by recognizing and communicating with each other. This type of network is therefore known as an Independent Basic Service Set (IBSS). In this typical wireless Infrastructure network topology, there is a mixture of hard-wired devices connected to the LAN that co-exist with wireless mobile stations. In Infrastructure mode, the stations connect to an existing network through an access point. The role of the access Point is to create a bridge between the wireless network and the hard-wired network and therefore is considered part of the wired network infrastructure. The mobile stations are constrained only by the breadth of the wireless LAN that is established by the physical location of the Access Point.